If you have seen swimmers of all ages doing laps in the pool and in the ocean it's because we are only weeks away from the popular program of ocean swims with the Pittwater Ocean Swim Series. The series starts with a bang, or rather a starter's siren, at Bilgola on Sunday 10 December. 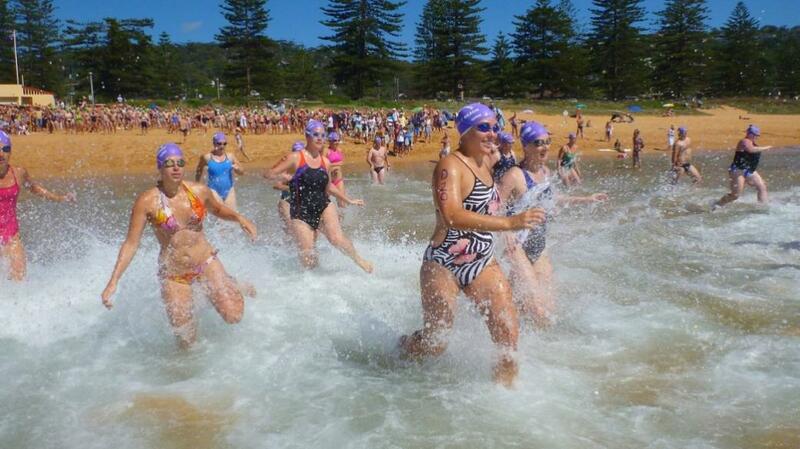 Bilgola offers 800m, starting 9.00am and 1.5kms starting at 10.00am courses for swimmers at the picturesque beach and it is always a well attended swim. With a great prize on offer for swimmers who complete three of the five Pittwater ocean swims they can get away to a good start at Bilgola. You can park at Porter Reserve, North Newport and catch the shuttle bus to the beach. The Newport Pool to Peak January 7th ocean swims will, for the first time, include a 400m course to attract younger swimmers aged 10 years plus. According to one of the organising committee, John Guthrie, there have been many young swimmers who wanted to swim but the minimum age for the 800m. and 2Kms. courses is 14 years. "So, the 400m swim, straight out and back from the club house, gives young swimmers the chance to try ocean swimming with lots of safety measures in place. Of course many of the younger swimmers train with squads and are pretty fast," said John. Pool to Peak swimmers are greeted with fresh, juicy fruit from major sponsors Harris Farm Markets. Every swimmer's number goes into the lucky draw for some excellent prizes. The 400m starts at 9.00am, the 800m at 9.15am and the 2Kms. at 10.00am. Free parking is available at Porters Reserve up the northern hill from the beach. Residents in the Northern Beaches Council area will be able to park free proving they have a 2017/2018 sticker on their windscreen at all the participating beaches. The next swim in the Series is Avalon on the 14th of January. The organisers of this swim always put on a swim to test the endurance skills of participants. Like all the Pittwater swims it is well organised and has captured a loyal following. The Avalon 1km swim starts at 10.00am and the 1.5Kms. at 10.30am. The Series continues the following weekend at Mona Vale on the 21st of January. It is a challenging 2.2Kms. swim, starting at 10.00am, from Warriewood Beach around the point to Mona Vale, an enjoyable journey to the finish line at Bongin Bongin Beach. It is known as the friendly, family swim. The club also has a 1.2Kms swim starting at 9.00am at Mona Vale and finishing at Mona Vale Basin. Enjoy fruit on your return as well as a barbecue . There are prizes for placegetters and a mystery draw for all swimmers. There is a free shuttle bus between Mona Vale and Warriewood with bag security. The final swim in the Pittwater Ocean Swim Series is the iconic Palm Beach to Whale Beach known as The Big Swim, run this season on January 28th, 2018. This was the pioneering ocean swim in the area starting way back in 1974 with just small group of swimmers trying out the challenge. It is known this time as The 2018 Macquarie BIG SWIM (2.5-2.8Kms. starting at 10.00am) & URM Little BIG Swim (Up to 1Km. with a limit of 400 swimmers starting at 8.30am). The URM Little BIG swim is another chance to try ocean swimming for the first time. 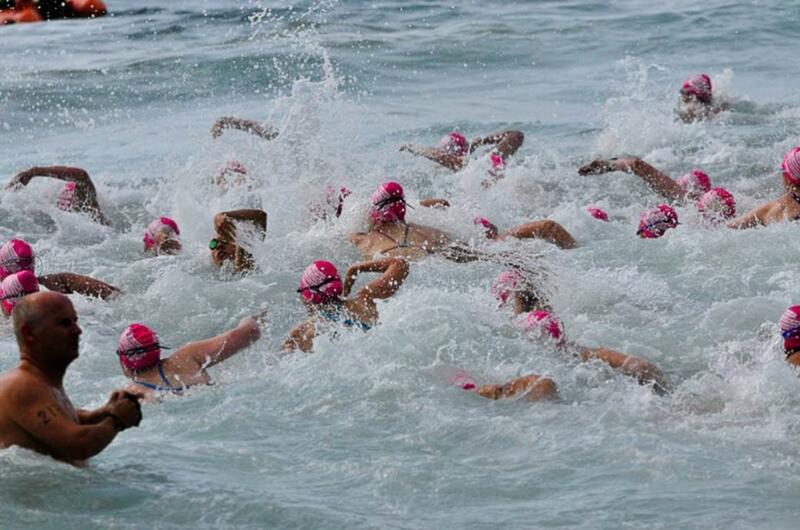 The Big Swim is the ultimate challenge that ocean swimmers rejoice in completing. You can see the look of satisfaction on their faces as they run up the beach to the finish line. Free transport from parking areas at Careel Bay soccer fields, is available. Rob Berry one of the organisers of the Pittwater Series says there are swimmers who are highly competitive and are looking to better their times for each event in the Series. "Then there are those who treat it like a fun run and are simply happy completing the swim in the wonderful, natural environment of the ocean. "Each of the ocean swims is organised by volunteers from the surf clubs at each beach and they have got it down to a fine art with an emphasis on safety and fun. "An enormous amount of organisation goes into the staging of each ocean swim drawing on the considerable experience of ocean swimmers and general surf lifesaving skills in the clubs. Each swim has a first aid station and there are teams of safety people in the water and on boards, skis, IRBs and surf boats. "It is however each swimmer's responsibility to train for the swims and to ensure they are physically fit to take on an ocean swim challenge. If a swimmer gets into difficulty they should raise their arm and wait for the safety team to come to their aid. "The surf clubs rely heavily on the funds raised for the purchase and maintenance of essential lifesaving equipment which benefits all beach goers who flock to the area during summers," Rob Berry added. "To qualify for the major prize of a trip to Byron Bay, swimmers must complete three of the five longer swims at each event in the Series. It's a great prize and it is based on the qualifying number of swims not your swim time. "Local Avalon Beach travel agency TravelView have been wonderful with their continuing support for the series providing the prize of air fares for two to Byron Bay and Bay Royal Apartments provide luxury accommodation for three nights and entry into the Byron Bay ocean swim in May 2018" Rob continued. Northern Beaches Council has recognised the tourism and business benefits of the Pittwater Series by providing a generous $5,000 grant towards the marketing of the swims. "At all the swims there is a feeling of camaraderie amongst the swimmers and they can be seen at the many coffee and boutique shops following the swims. It's certainly good for local businesses. "Many swimmers bring family members and friends with them for support and they make it a fun day out. It's a great atmosphere at all the beaches when the swims are on. Each club also has its own barbecue and prizes making it a rich experience," said John Guthrie. Swimmers come from around Australia and from all over the world highlighting Pittwater's unique environment. You can enter all the swims at www.oceanswims.com.au It is wise to enter online to avoid the last minute rush. For The Big Swim and The Little BIG Swim you must enter online. For all the other swims you can enter on the day and entry fees can be seen at oceanswims.com.au. Pittwater Online News supports the Pittwater Ocean Swim Series 100% and does not charge to run any news/marketing items received.